The Whynter 14,000 BTU Dual Hose Portable Air Conditioner is a powerful portable air conditioning unit designed specifically for medium to large rooms. It is a great choice for people who live in apartment buildings which do not have built-in air conditioning. The unit is built out of a hard sleek plastic shell with a black stripe down the center of the machine. It has a very modern and sleek design and it is relatively small – can fit nicely in a corner of a room. This portable air conditioning unit is one of the most powerful portable air conditioning units on the market. Of course, it is slightly more expensive than most air conditioning units but it is well worth the price. 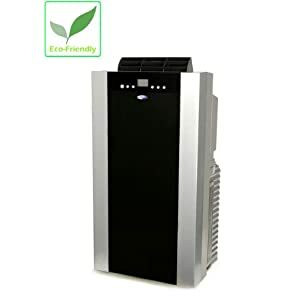 So if you are looking for a great high quality portable air conditioning unit and you don’t mind spending some extra cash; the Whynter 14,000 BTU Dual Hose Portable Air Conditioner is for you. All in all this is an excellent portable air conditioning unit for larger rooms. You can even use it for small apartments. The fans are very powerful and the air conditioning mode produces clean filtered cool air. The device is very quiet even when on max settings and on air-con mode. The window kit is simple and easy to install on almost any window frame. The unit is very user friendly and easy to configure and the design is sleek and modern. The device is quite heavy and the dehumidifier can be quite loud at times. The screws are not very effective – they are too short and can pop out of the case at times. If you want to mount it onto a window frame it is recommended to tape the screws into the plastic casing. This is an Excellent A/C that I've bought. It works great as advertised - and even better with hoses insulated. I highly recommend it! Like most air conditioning units this particular model has three modes of operation: fan, air-con, and dehumidifier. The fan mode simply blows room temperature air into the surrounding area. It is recommended to use the fan mode if the temperature is not too hot – you will save electricity in the long run. Additionally, the ARC-14S has a high quality Carbon filter which filters out dirt from the air – it can even help remove odors from the air as well. In other words, if you want to freshen up a room, place the ARC-14S inside, and either turn the air con or the fan on and the room should air out in a relatively short period of time. The air-con mode consumes a considerable amount of electricity but it can cool down a room in a matter of minutes of the power level is set to max. Each mode of operation has 3 levels – 3 is the max level. You can schedule each of the modes for a 24 hour cycle if you want; there are many different ways that you can configure the ARC-14S. Additionally, the dehumidifier mode is exceptionally useful when it comes to absorbing moisture from a particular room. Atmospheres with high levels of moisture can be very uncomfortable and they can cause mold to grow on clothes or walls. The dehumidifier mode will efficiently absorb up to 101 pints of water from the air per day. You can configure each of the modes by using the remote control that is shipped with the device or by tinkering with the buttons on the device itself. A bright LCD screen on the device will help you configure it’s settings with relative ease. The dehumidifier is also equipped with an auto-drain technology. The ARC-14S is very user friendly and it is very easy to change the temperature settings on the device. There are two ways to change the temperature settings on the ARC-14S: use the remote control or use the buttons on the device. It is generally recommended to use the remote control instead of tinkering with the buttons on the device. You can choose to set the machine to automatic settings (automatically detects which settings are optimal) or manual settings (you have to configure all the settings individually). Each mode of operation has three fan speeds. It is very easy to switch between fan speeds and modes if you use the remote control that is shipped with the machine. The vents will also bend in different directions. The device automatically shut down once the room temperature is at the desired setting. As I mentioned earlier this particular model was specifically designed for larger rooms. It has a BTU capacity of 14000 and it utilizes a dual hose air conditioning system. The vast majority of portable air conditioning units use a single hose system – dual hose is much more effective. The coverage area is approximately 500 square feet; in metric units that is around 46 square meters; the average size of a living room or master bedroom. The ARC-14S has excellent coverage and when the air-con mode is set to max fan speed cold air will blast out of the vents and cool down the area in a matter of minutes. The fan speed is very strong when it is set to max settings but it can consume a lot of power so be careful not to leave it on for too long or you will be faced with a large electricity bill. The noise level in this particular unit is not much different from most portable air conditioning units. You would expect that it will be much louder than regular units but that is not the case. The fans are built with state of the art noise reducing technology which allows the machine to produce large amounts of cold air will operating at a quiet noise level. If you have never slept with a portable air conditioner in your room it may take some getting used to. The machine is at its loudest when the dehumidifier turns on. You can program the dehumidifier to turn on during the day time so you don’t have to worry about it disturbing your sleep. The noise level has been rated at 56 decibels. Since this portable air conditioner is quite powerful it requires a considerable amount of electricity. The most demanding mode of operation is the air-con mode. The other modes are less demanding but still require a significant amount of electricity. The maximum amount of electricity this unit consumes on max settings is around 1250 watts. I mentioned earlier, if you want to avoid a large electricity bill it is recommended to either use the fan mode or simply turn on the unit only when the heat is unbearable. The ARC-14S is slightly larger than most portable air conditioning units but small enough to find a spot in the room for it to fit comfortable. It has the following dimensions: 19″ x 35.5″ x 16″ and it weighs approximately 95 pounds. It has a set of wheels on the bottom of the case to make it easy to move the machine around the house. The Whynter 14,000 BTU Dual Hose Portable Air Conditioner contains several features that make it unique. For instance, the auto-drain feature is exceptionally useful as it eliminates the need to manually empty the water basin. It is also equipped with a Carbon air filter and a washable pre-filter to guarantee that the air the device produces is top quality. It will also auto restart when a power outage occurs and you can control all of the settings digitally. The ARC-14S is shipped with a window attachment kit and a remote control. The window attachment kit is designed to fit windows of all sizes. Of course, if you need to set the unit on a window make sure to read the manual before you begin the operation. You may have to purchase an additional exhaust hose depending on the distance from your window to the machine. Overall positive; the Whynter 14,000 BTU Dual Hose Portable Air Conditioner certainly does its job at cooling down rooms to a comfortable temperature. It is a great powerful air-con unit that is great for small apartments. If you don’t mind spending some extra cash this unit is the right unit for you. It will keep your apartment nice and cool during those unbearable heat waves. You can even use a regular house fan to distribute the cold air throughout your home.